A couple of weeks ago, I was at Target and finally found an excuse to kill a gift card that I had been sitting on. They had a handful of blaster boxes that actually appealed to me; or more likely I was reaching because I wanted to open some packs before school started. 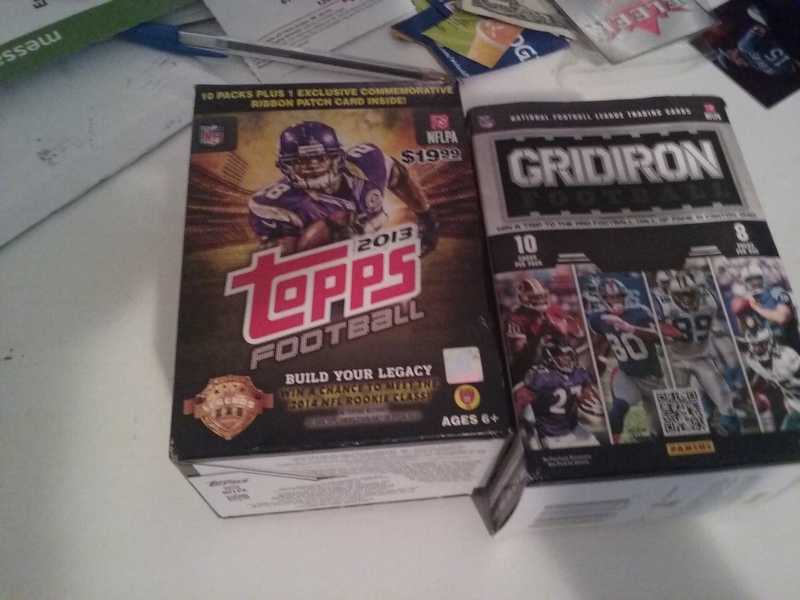 I chose ‘Topps 2013’ and Panini ‘Gridiron Football’ from 2012. A little nitpick to start off: I was appalled at the condition of the cards. You would think that blaster boxes would be safe from excess damage but cards looked like they were handled and sorted several times over. None of the cards would have got an 8.5 or 9 grading. The first thing that I noticed when I took out the patch for the ‘2013 Topps’ patch was a big ding on the bottom right hand corner. It was appalling. I do love the patch though. 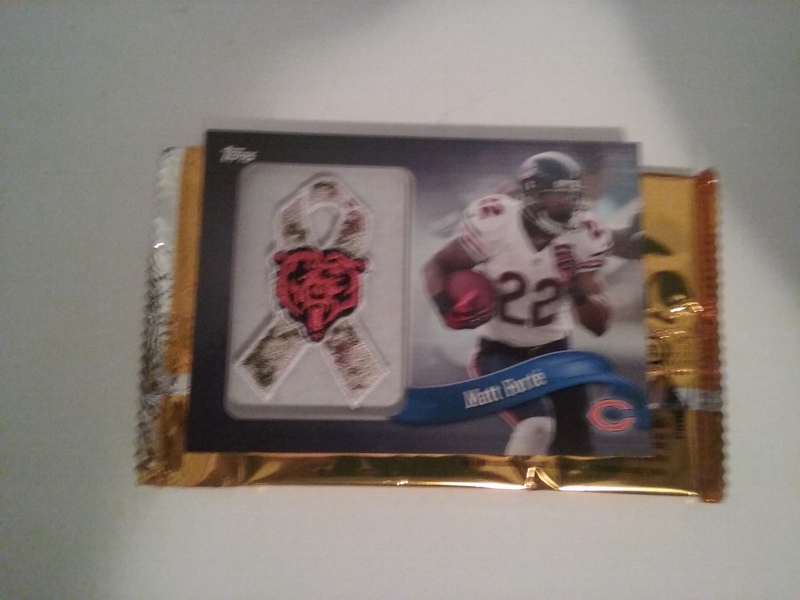 Matt Forte is an awesome player and I like the Bears logo that was used. Instead of going with a the C, we got an actual bear. The rest of the box was filled with all base. As for the ‘Gridiron Footall’ box, I found breaking it to be a rather enjoyable experience. 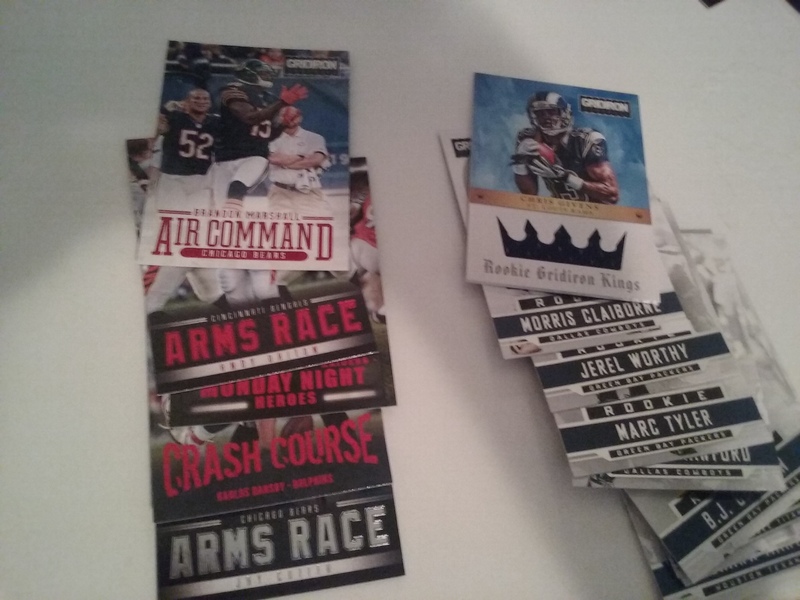 Noticeably absent were rookie base cards, but that was made up for with rookie inserts. Those cards fell to about one per pack. I also pulled a nice jersey card from the box. In reviews of the product on YouTube, you’ll notice that hits are not guaranteed in each box. The card-stock on the card is very similar to Upper Deck ‘Masterpieces’ and similar products. I loved it. Sure Chris Givens is barely holding on in the league but I had to remind myself that if I pulled this in 2012, I would’ve been ecstatic. For $26 I have done a lot worse. I probably would have been disappointed if I didn’t pay with a gift card though.